In my “Automating EPMA” presentations over the past year, I have focused on EPMA and the EPMA Batch Script Utility, as well as ADS files, the EPMA File Generator, diagnostics, the different EPMA libraries, Calc Manager, automating security via MaxL for Essbase, etc. That obviously has not been this series; this series can almost be treated as a real life application of the real world problems for EPM(&A) administrators. The consultants/developers are gone…how do I make my life easier again? I have been an in-house administrator a couple times, so I completely understand the industry administrator role. One thing I try to keep in mind when developing a technical solution is how will maintenance be performed? As with any new EPMA installation, there *many* new features (? ), modules and technical solutions that are new to the in-house administrator. Keeping the lights on for the new system will not be the same as it was before…so how I can lessen the blow of learning new administrator tasks? The main way I try to help is by setting up the automation. If you think about it, if you have an automated process in place for the administrator, they can look at the code and find out the order of operations. Also, it gives them a starting point for figuring out issues outside of the Administrator’s Guide and Documentation. So…how do you do this in an environment where the Essbase cube is deployed from EPMA (as it is shared with, say, HFM and Planning as far as dimensionality goes) and all the other items are handled in EAS (calc scripts, data loads, data clears, etc)? If the steps keep passing, then the script keeps running. The script will stop when an error has been encountered. More error handling can be added (using methods shown yesterday) or removed, depending on your goals. In this example, the components of the update were broken out into pieces into folders on the server. These components are called through the script. The individual components each have their own log files (and error files, if necessary) and are combined into one, large log file at the end of the script for ease of viewing. I will start by stepping through the different portions of the script, followed by a few examples. You will notice that the top starts with “:Menu”. This tells DOS to present a menu option to the user. 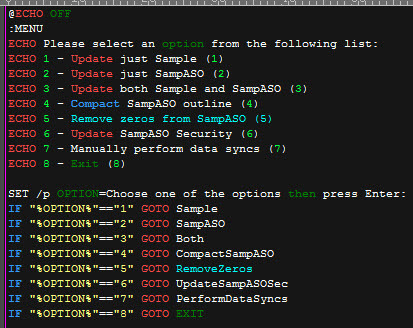 The second part to this section is reading what the user wrote for an option then telling the system where to go for the commands. The second section, the Selection Process, is defined by you and is where you build out the process for running the steps needed. Validate the outline in EPMA (why go through the remaining steps if the outline won’t deploy from EPMA later on?). The very first thing I do (for each step) is to delete the previous log files. MaxL is good about replacing old log files with only the current information. 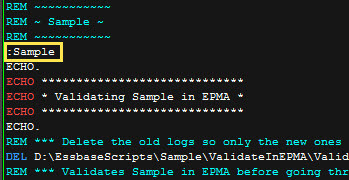 EPMA will append the current log file to the old and can create an extremely large log file if you are not careful. Note here that you can do the EPMA batch error trapping here, if you would like. This original script was around 3000 lines already, so I did not add the additional lines. Note that no MaxL error trapping was done in this example; rather, an error log file was created and that was used for error checking versus codes since the script is so basic. If a longer MaxL script was used, performing multiple commands, it would be better to use error codes. Run the MaxL script to clear the data from Sample. One note here before I start…this script is dynamic to the point that if the export got to 6 files, then they can all be loaded. In reality, only 2 files are created, so there is room for “data growth”. There are probably other ways of testing to see how many files are produced with a given naming convention and I encourage you to use what works best for you! I will finalize the process by combining all the log files into one and let the user know that everything was a success. So there is MUCH more you can do to piece this all together. I am putting my full code list in the “BOX” section of my blog for you to use, modify and make for your own. Please give me feedback…I like this little tool and want to see it out in the wild! That way, when it produces additional datafiles because it splits over the 2gb file limit they will be automatically loaded. No need to create multiple load files. This works even BETTER when you split the outbound file into multiple parts – (export database sample.basic data to data_file ‘SampleExport1′,’SampleExport2′,’SampleExport3’;) – because then it will do parallel data exports and be lightening fast on export and import. 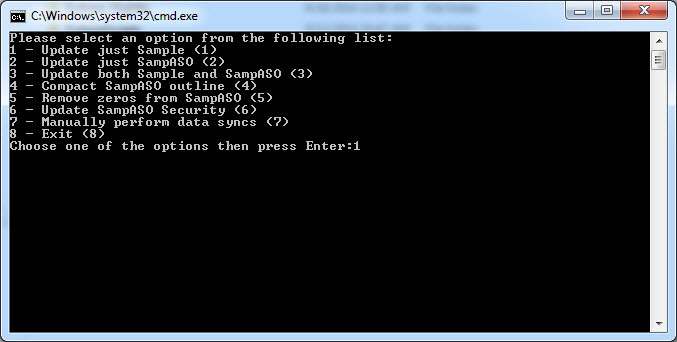 import database sample.basic data from server data_file ‘..\\SampleExport*.txt’ which will trigger it to look in server path and reduce some of the disk overhead. And that’s about as quick as you can make it! Yes, you are correct! I actually forgot about that trick and implemented it after you reminded me. Thank you for the refresher! Love it! !